Ever found yourself feeling inspired after watching home remodeling shows only to feel deflated because you know you don’t have the know-how to accomplish something like that? You’re not the only one! Allow us to outline some home improvement hacks you can upgrade your home even if you consider yourself mechanically-challenged. 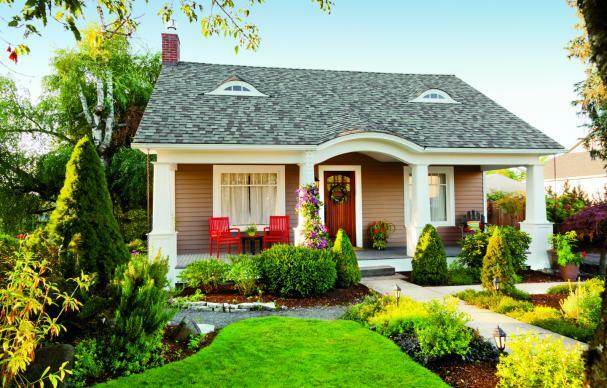 We’ve compiled a short list of some easy things to do inside and outside to keep your house running smoothly, looking great and building value. You’ll be happy to know that according to the Appraisal Institute, the nation’s largest professional association of real estate appraisers, homeowners who choose upgrades instead of major remodeling projects see the greatest potential return on investment! Lighten up your kitchen by giving your worn old cabinets new life. Just sand and paint. That’s a whole lot less expensive than replacing them with new ones! Changing room drapes is a fast and affordable way to add decorator detail. New window treatments are a cost-effective way to add a pop of stylish color. Create the illusion of height in low room by repositioning drapes and valances higher on the wall. Swap a ceiling light fixture for a lovely small chandelier. The formula for sizing a chandelier: Room width + Room length in feet = chandelier diameter in inches. If you already have an overhead light fixture in place, it’s not expensive or difficult to add a ceiling fan. A new fan will provide much-appreciated air circulation during the hot months and help save on your electrical bill. LED Under-Cabinet Motion sensor lights are inexpensive and easy to add to any kitchen. They fully illuminate your counter space and make cooking day or night much easier. Replace your house’s tiresome drawer pulls with vintage-inspired or unconventional, blinged-out pulls that are available in a smorgasbord of shapes, sizes and colors to fit your design taste. Drawer pulls are the easiest way to give doors, cabinets and dressers and immediate facelift. Cabinet rollout storage units are one of the simplest, most rewarding and practical upgrades you can make to your kitchen space. All at once everything that’s hidden out of sight in the back of cabinets is right at your fingertips giving you instant usable storage space. Wire closet organizer systems are inexpensive, practical and easy to install. They increase your storage space and simplify cleaning too. With nearly everything hanging on the walls suddenly keeping the floor clear for vacuuming just got easy. Add bathroom accessories like a pullout mirror so you don’t have to lean over the sink, multiple-level towel bars; a luxurious towel warmer; and a self-closing toilet seat for quick upgrades to your bathroom. Everyone will thank you. While you’re at it, upgrade your showerhead with one of the latest models for ample water pressure and thrifty water usage. Replace or add a cost-effective water heater insulation blanket to reduce your home’s energy loss. Pour a package of your choice of a brightly colored kid’s drink into the toilet tank to see if the water in the toilet bowl gradually turns color without flushing. If it does, your toilet has a slow leak. Fixing the problem is pretty easy with a new rubber flapper or a brand-new toilet kit. Adding insulation to your attic is a super-fast way to lower your monthly utility bills. Check the U.S. Department of Energy web site to see the best level of insulation for your area: www.ornl.gov/sci. Replace your washer’s old-fashioned black rubber hoses with super-strong and long-lasting braided stainless-steel hoses and prevent a ruptured hose from turning your laundry room into an unwanted swimming pool. Take control of your home’s lighting by switching lights to timers or adding dimmer switches to your wall or ceiling lighting. Save money and set the mood all at the same time. If your front doorway is overwhelmed by greenery, it’s time to get out the shears. Replace overgrown shrubbery with zone-perfect flowering plants mixing colors, shapes and dimensions for dramatic effect. If you have a flagstone walkway, applying a stone sealant will give it a permanent shine and enhance the color. Plant a natural privacy wall. Few things grow as fast as bamboo, but potted evergreens can be repositioned and are a bit easier to manage. A set of string lights can create a romantic mood in any backyard or turn your plain patio into a welcoming invitation for friends and family. Want to create a much more inviting outdoor dining experience? Just add a patio heater and you could be enjoying all of your meals al fresco. You can hide that less-than-attractive air conditioning condenser with a charming wooden trellis. Spruce up the approach to the front of your house by adding a simple brick border along a plain concrete sidewalk or driveway. For an updated look outside, remove dated awnings from over doors and windows. From one end of the house to the other these quick, affordable upgrades and simple fixes let even a novice make a big impact. So don’t let those home improvement shows intimidate you! You can make a big impact on your home’s value without having any repair experience at all!